The Mask of Zorro is an adventure that begins with a young Don Diego de la Vega fighting oppression as the legendary Zorro. Twenty years pass. Don Diego must now find a successor to stop the tyrant, Raphael Montero, who years earlier left him to rot in prison. He chooses Alejandro Murietta, a known bandit, and transforms him into the fearless romantic hero he once was to carry on the legacy of Zorro. Who was that Hero Horse? A magnificent black stallion named Casey played Zorro’s beautiful horse, Tornado. 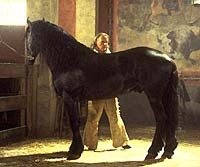 In the film, the horse is referred to as an Andalusian, but Casey is actually a Friesian. Two other horses, Duke and Fedde, doubled for Casey in some of the scenes. It is unusual in the horse world for a stallion to be used for performance purposes. Stallions are hormone driven and can be dangerously powerful creatures. They are territorial around other horses and can be aggressive in the presence of mares. They are often unpredictable and high strung. However, Casey is an exceptional animal actor who has remarkable trust in his trainer, Bobby Lovegren, and was able to socialize well on the set and accomplish the stunts required of his character, Tornado. The legendary Zorro rides back onto the silver screen. Horses are used throughout the film performing many stunts. Trained rearing and jumping horses were used with professional wranglers and stuntmen doubling for the actors. For some of the close-up, point-of-view shots, a fake mechanical horse was used, built specially to double for the hero horse. Horse make-up included water based non-toxic dye to match the stunt horses. For the hero horse, Tornado, hair weaves were added to the mane to give him a particularly opulent look. These were not permanent and were easily removed. In the opening sequence of the film, trained horses were used to climb stairs and ramps surrounding the walls of the city, as Zorro rescues innocent prisoners from a firing squad. Zorro’s horse jumps across the rooftops and rears atop a building with the setting sun as a backdrop. This sequence was filmed in cuts and the trained rearing horse was walked up specially designed stairs reinforced to hold its weight. A special railing was built for the jump (which was approximately four feet across) and was also performed by a trained jumping horse. Padding was laid to protect the horse’s footing. Rearing was filmed separately of the crowd and an experienced rider was used. For the sword work done while on horseback, or swords seen as costume pieces for riders, prop plastic swords were used. Zorro makes a leap from the balcony to land in the saddle of his horse and make his getaway. The scene was shot in cuts and a stunt man doubled for the actor. The horse was prepped for this stunt and additional padding was used under the saddle. The height from which the stuntman jumped was not as great as it appeared. When Spanish guards ride into the marketplace with a “wild” horse in tow, the horse breaks free and rears. Alejandro, impressed by the beauty of the animal, rushes in, calming the horse before the guards retrieve the steed. This is only one instance of work done by horses working free of human contact, or “at liberty” throughout the film. For this free work, the horses were trained with visual signals, sound cues and food rewards. To insure safety, five wranglers were stationed surrounding the marketplace. Two key trainers, one at point A and one at point B, gave the cues for the horse to run, rear and calm down. In later scenes when horses are seen running free, the procedure is the same, but the outlying wranglers are on horseback acting as pick up riders. Alejandro is determined to make the wild horse his own and breaks into the Cuartel, the guard barracks, to steal the horse. The horse explodes with energy, kicking and rearing, destroying bunk beds and doors as he and the heir-apparent Zorro escape. Before leaving, Zorro sets off a cannon to hold back the guards demolishing the entire Cuartel in flames. For this scene, two trained rearing horses were used in rotation, along with professional stuntmen. The bunk beds and the doors that the horse strikes were made of light balsa wood and glue with no nails or screws used. Special rubber pads that looked like tile were used on the floors for sound footing and a rubber sword was used on the saddle for safety. Sound effects of horse’s hooves on tile were added in post-production. The scene was shot in cuts and no horses were on set when the explosions or fire were being used. Sounds of frightened horses whinnying was added in post-production. In a chase scene where the guards pursue Zorro through the woods there are a great many stunts and difficult riding scenes. Before filming, the roads over land and through the woods were prepared and cleared of any debris. Since there was some heavy running, the chase was actually done as many short, fifty-yard runs and the horses were changed out frequently and given lots of rest. During this chase, Zorro not only rides two horses at once in a standing position, but also jumps a log and lands again atop the two horses that galloped underneath the fallen tree trunk. Specially designed tack and padded roman saddles were used for the stunt. The horses were trained to run under the log in pre-production. There were actually very few rehearsals on-set and the scene was accomplished in one take. For additional safety, the galloping was really done at a controlled lope and speeded up in post-production. Throughout the sequence, pick up riders were placed in key positions as a precautionary measure. During the major battle at the gold mine, there was lots of gunfire, swordplay, explosions and fire. For the gunfire, either quarter loads were used or flash guns, which had no sound. When quarter loads were used, horses’ ears were protected with cotton. Flash explosives were also used with sound effects added in post-production. Zorro and his archenemy, Montero, engage in a violent sword fight near a wagon team. The fight was actually staged with prop swords and the sound of the metal striking was added in post-production. During the fight, a sword strikes the wagon rigging and the horses bolt away. Wranglers, out of camera range, held the horses that were prepped for the action. The harness was a specially designed breakaway rig that fell away as the horses were released. When the wagon is filmed going over the cliff, or when the fire and explosions were being filmed no horses were present. Other animal action consisted of horses pulling wagons, oxen pulling a grinding stone at the gold mine and some background livestock. In scenes where the wagons are giving chase, experienced drivers and wranglers handled the horse teams with pick up riders present. The grinding stone that the oxen pull was actually a styrofoam prop, preventing any stress to the oxen. Background animals were placed and cared for by experienced handlers.